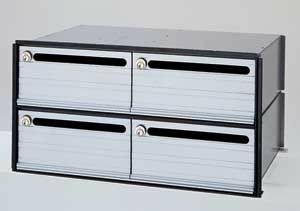 Similar to the 2200 Series, these data distribution boxes are ideal for distribution of interoffice mail. They are designed to fit into the Rack Ladder System, Rotary Mail Centers or 101C Modular Enclosures. Please call for custom configuration. • 3/4" slot in each door.